In new homes and when remodeling, the Illinois Plumbing Code now requires the use of pressure balanced bath/shower valves to prevent scalding. There is more potential for scalding of a person showering if the pressure fluctuates. Most people aren't aware that young children and older persons can be scalded much sooner than adults. Lowering the water temperature at the water heater will minimize the potential danger at the tub spout or shower head and is the best way to prevent scalding. A small child doesn't have to soak in overly hot tap water to get scalded. Tragically, injury can happen literally in the blinking of an eye. 150-degree water can scald in just 1/2 second, 140-degree water scalds in just 1 second, but it takes four minutes for water at 120 degrees to scald. Caution: Never let a small child bathe unattended. In addition, always turn cold water on first, followed by the hot water until the desired temperature is achieved. This prevents exposure to straight hot water. You need not rush to buy another shower head if the one you have suddenly gives off an uneven spray. It's probably clogged with mineral deposits, which build up in the showerhead and distort the shower stream. 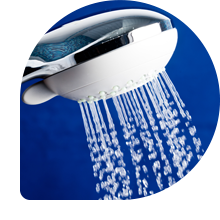 If the showerhead holes are clogged, remove the face of the showerhead; clean the back surface and free holes with a coarse needle. The latest showerheads on the market are all self-cleaning and need no such attention. When changing showerheads, wrap adhesive tape around the packing nut or pad the wrench jaws with a cloth so you won't mar the finish. Shower curtains made of washable fabric can be put into the washing machine or laundry tub. Spreading flat on a table and sponging with sudsy water should clean all other shower curtains. Rinse the curtain with clear water, then wipe with a clean cloth. Turn the curtain over and repeat on the other side. Then replace on the shower rod and spread it out straight to dry. While you're at it, give the shower rod a good cleaning. Clean prefabricated shower stalls with soap and hot water, but never with a gritty abrasive. New shower stalls usually have fiberglass or acrylic walls, which will not withstand heavy scouring powders. If you stand in it to wash the inside walls, the floor should be protected by a heavy cloth or papers.